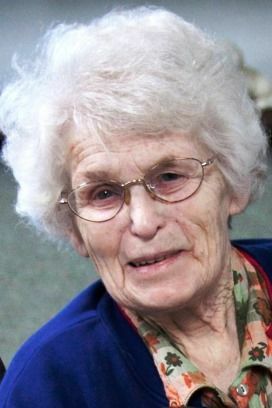 WESTBY — Thelma A. Amundson, 93, of Westby died peacefully Thursday, Jan. 31, 2019, at Norseland Nursing Home surrounded by her loving family and caregivers. She was born to Rudolph and Christine (Rundhaugen) Bagstad Sept. 4, 1925. She was united in marriage to Melvin Amundson Sept. 21, 1944. Thelma loved going to a Friday night fish fry with her husband and friends. She enjoyed sewing and crafting for the Norseland Bizarre, writing letters, doing puzzles, loved to dance, and enjoyed traveling to see new things. Thelma was a wonderful baker and always had something baked for the kids when they got home from school every afternoon. She had a way with animals, as all the dogs and cats loved her. She would often talk to them and it certainly seemed like they understood what she was saying. Thelma is survived by her children, Karen (Carl) Goldsmith of Chatfield, Minn., Michael (Eleanor) Amundson of Stoddard, Randolph (Marion) Amundson of Cashton, Mary Amundson (Al Berger) of Westby, Ann (Vern) Polley of Henrietta, Texas, Kristine (Toebin) Wine of Plano, Texas, and Laura (Jim) Brueggen of Norwalk; 31 grandchildren; 54 great-grandchildren; and four great-great-grandchildren; brothers, Lester and DeVerne (Perlie) Bagstad; as well as by many nieces, nephews, and other relatives. She was preceded in death by her parents; husband, Melvin; sons, Russell and Larry; sisters, Cornelia and Ruby; son-in-law, Charlie Mikkelson; and grandson, Russell. Funeral services will be held at 1 p.m. Sunday, Feb. 3, at the Immanuel (Moen) Lutheran Church. Pastor Amanda Schultz Garcia will officiate, with burial to follow in the church cemetery. Friends may call from noon till the time of service. Online Condolences may be offered at www.VossFH.com. The Vosseteig Funeral Home, 708 S. Main St. in Westby, is serving the family.